Landscape art of Florida includes beautiful beaches, dramatic sunsets and some wonderful water scenes. Created with computer art software, these landscapes include overlay images of Lover’s Key State Park, Lowdermilk Park, and the many beaches, canals and swamps of Southwest Florida. Sunny Forest Landscape art is fine digital impressionism style art by artist Mary Clanahan. Horizon Beach is ocean landscape art by fine digital artist Mary Clanahan. Buy art prints or view image gallery of landscape art. Ocean landscape art by fine digital artist Mary Clanahan. Image gallery and links to landscapes of oceans and beaches. Paysage Abstrait or Abstract Landscape, whatever you call them, they are awesome and fun to make. Florida landscape art images displayed in a gallery. Art landscapes of Florida sunsets, beaches, water and swamps. Impressionism art by fine digital artist Mary Clanahan. Impressionist art images in gallery. Layer art called Full Moon Africa is a landscape of Africa with full moon and silhouetted trees. 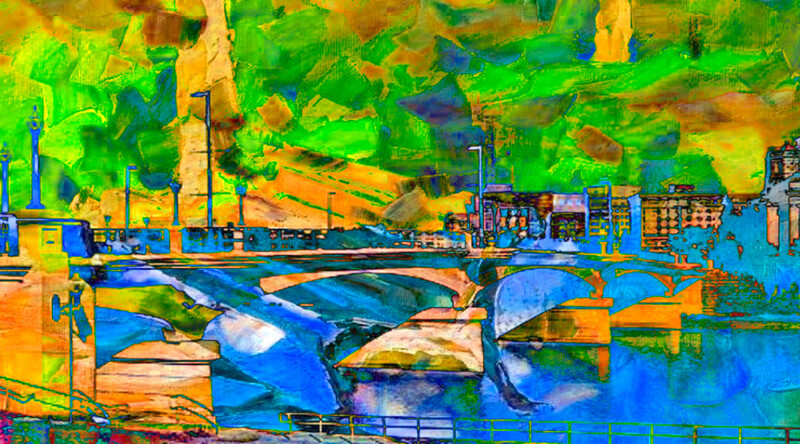 Image of art and links to layer art and landscape art image gallery. A layer art landscape of a green field at sunset displayed as an image with landscape layer art image gallery. Links for landscape, layer art and the artist. Sunsets, beaches, trees, pastures, hills, mountains, skies, fields, farms, flowers and more in the Landscape Art Gallery.